It’s named after 13-time U.S. Representative John Paul Hammerschmidt, who represented Northwest Arkansas in Congress up until his retirement in 1993. The menu at JP’s includes a lot of interesting items, such as Pork BBQ Quesadillas, Mesquite Grilled Salmon and a selection of hand-cut steaks. But it’s the burgers we were told about, so that’s why we went. 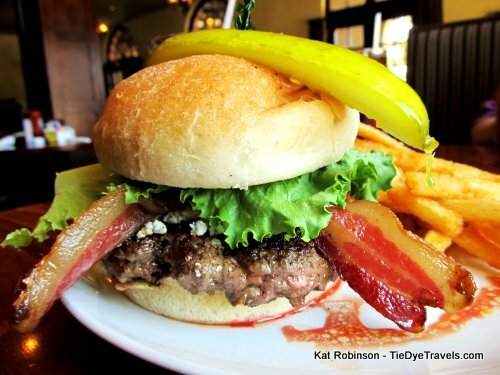 JP’s offers eight different burgers, ranging from the Avocado Burger to the Chipotle BBQ Bacon Burger. I chose the simple route and had The John Paul ($6.25, $.75 more for cheese) with Cheddar. My companion had the Black and Bleu Burger ($7.50). 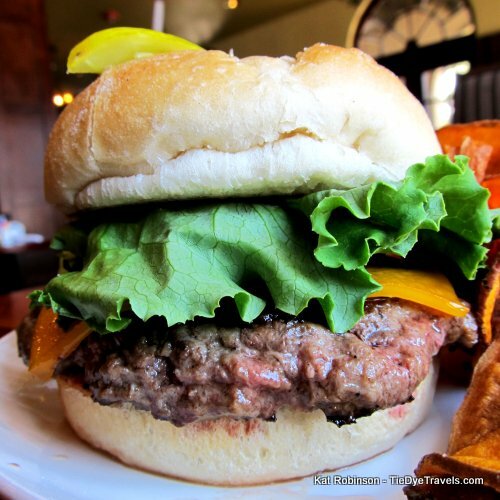 We were asked how we’d like our burgers cooked — since the burgers are made from freshly ground sirloin they can offer burgers on the rare side. We both chose a medium rare — though our waitress would later say she heard my companion wrong and wrote his down as rare. The burgers were delivered with their side dishes. 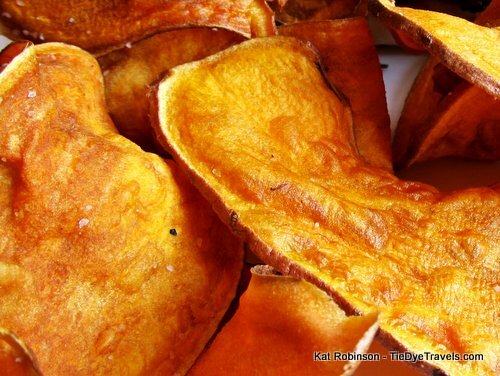 I had chosen sweet potato chips and they had come out crisp but still a little soft in the middle, quite obviously house-made with a sprinkle of sea salt. They were tasty. 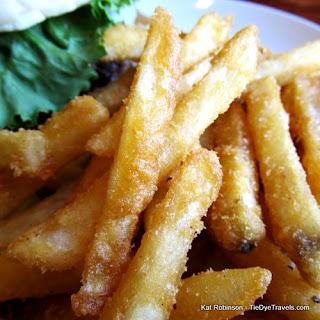 chosen the house fries, beer-battered fries also dusted with sea salt. These he declared the best fries he’s had in Arkansas… and I have had a hard time trying to figure out better ones myself. Crisp on the outside, soft on the inside and with a delicious flavor base, they are hard to beat. That being said, he was quite pleased with the whole shebang. While the meat was just a tad under-seasoned for his taste, the blackened spice made up for it, as did the crumbles of blue cheese. The bacon was strongly hickory smoked and added a nice Arkansas-type flavor to the affair. My burger? It like the other was served on a butter-split top bun with a pickle spear anchored to the top. 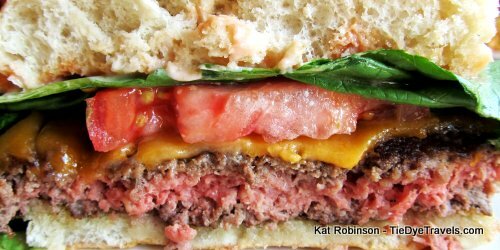 Under the bun rested green leaf lettuce, a chunk of tomato and white onion ringlets on top of the Cheddar. Condiments are served on the side. It’s a beefy burger - low on the spice, sure, but with such a good flavor to the meat I don’t think you need anything more. And yes, it was deep pink. Very deep pink. But warm in the middle — unlike my companion’s which was almost cool to the touch. 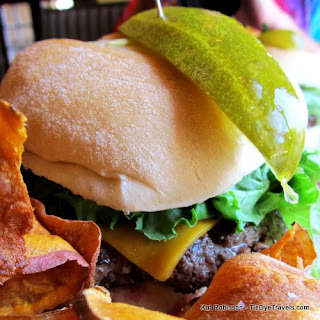 These are worthy burgers, some of the best I’ve had on this burger journey. I’m very interested to see if word gets out about it. I mean, it’s in Harrison — not some place you’d usually think of when you think of burgers but a worthy stop nonetheless. Give it a shot. You’ll find JP’s Restaurant and Gathering Place inside the 1929 Hotel Seville at the corner of Main Street and Ridge Avenue. Parking is in the deck at the back of the hotel or in the lot to the north side. It’s open every day for lunch and dinner and has a full bar. (870) 741-2321. And the menu is on the hotel'swebsite.